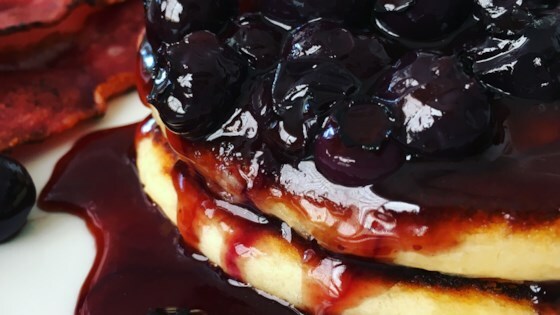 "Delicious, warm blueberry sauce which is fabulous on pancakes, waffles, cheesecake or ice cream! Fresh or frozen blueberries work equally well." In a saucepan over medium heat, combine the blueberries, 1/4 cup of water, orange juice, and sugar. Stir gently, and bring to a boil. In a cup or small bowl, mix together the cornstarch and 1/4 cup cold water. Gently stir the cornstarch mixture into the blueberries so as not to mash the berries. Simmer gently until thick enough to coat the back of a metal spoon, 3 to 4 minutes. Remove from heat and stir in the almond extract and cinnamon. Thin sauce with water if it is too thick for your liking. See how to make a delicious blueberry sauce for breakfast and dessert. The almond flavor enhances the blueberry flavor--amazing! I like about a tablespoon less corn starch. I have also made this recipe with lemonade instead of orange juice.